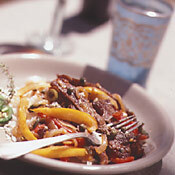 RECIPE TITLE "Cuban-Style Beef and Peppers Recipe"
Combine raisins and rum in a small bowl; let stand 30 minutes. Trim fat from steak, and cut steak into thin strips. Heat oil in a large skillet over medium-high heat. Add onion, bell pepper, and jalapeno, and saute 10 minutes or until tender. Add steak and garlic, and saute 4 minutes or until beef is browned. Add raisin mixture, capers, thyme, cumin, olives, and tomatoes. Reduce heat; simmer 7 minutes or until steak is done, stirring occasionally. Serve over rice. Recipe reprinted by permission of Cooking Light magazine. All rights reserved. Cooking Light Live a healthy, happy, lively lifestyle with Cooking Light! Turn your favorite recipes into tasty low-cholesterol meals. Thicken sauces without using butter or heavy cream. Add flavor to your soup without adding a ham hock. Season foods sublimely without using salt. From tempting appetizers to delectable desserts, Cooking Light shows you how to use more nutritious ingredients in every single dish you prepare. Every recipe in Cooking Light is kitchen-tested -- and tasted -- to guarantee you're always serving your family and friends healthy foods that look and taste absolutely divine.Plus, Cooking Light keeps you posted on the most current scientific data and even turns it into practical life-enriching, life-saving guidelines you and your family can live by. You'll find insights, facts and statistics on how lifestyle changes can add new vitality to your life and actually decrease the risk of life-threatening diseases like cancer, diabetes, hypertension! You'll also become a more informed shopper, able to read between the lines on food labels. Dine well and dine light with Cooking Light!